If you’ve had your fill of EPL, La Liga or Spanish Leagues and let’s say you want to add some spice to your football life, how about keeping tabs on next year’s RoboCup football final. In order to promote the cause of designing machines capable of carrying out more complex tasks, a group of scientist came together to form a RoboCup football final aimed at showing the skills of these tiny robotic creatures. 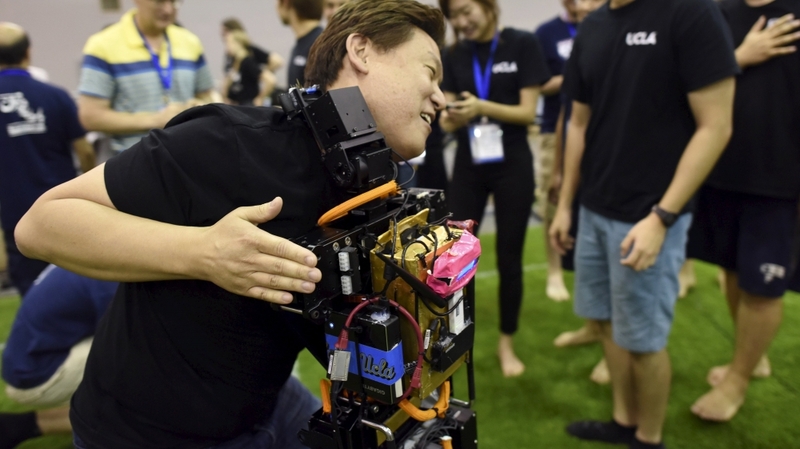 A total of 175 robot teams from 47 different countries and regions took part in this year’s event, according to the China Daily newspaper. This year’s event ended well with the American team of humanoid robots defeating their rivals from Iran. The USA team was represented by the University of Pennsylvania named THORwIn. The game was the final of the largest “adult” size category in the RoboCup Football Final. If you watch the video below, you would notice how awkward these robots play, very awkward as a matter of fact! In as much as I love football, I don’t think I can spend 45minutes watching these dudes play. Can you? Good News Nigeria, You Can Now Create Twitter Ads Directly! Nigeria Recorded 76,907 Active Domains On .NG in 2016 — NiRA. Own An Ntel SIM? You Might Want To Download Ntel's Official App That Would Let You Call & Text Over LTE. I’d watch a 90mins game if I was chanced. Really!? Did you watch the video clip? Hmmn have you ever considered buying a robot as a pet? Watch robots play football? No, thanks. I can’t imagine sitting down for good 90 mins watching robots! Lol how do they even celebrate a goal? Hahaha. I didn’t watch the video tho, but was there any commentary? Like seriously? Woman, you like football?